Astronomers have discovered the first auroras ever seen outside the solar system — alien light shows more powerful than any other auroras ever witnessed, perhaps 1 million times brighter than any on Earth, researchers say. Auroras could soon be detected from distant exoplanets as well, investigators added. To see if auroras might be seen outside the solar system, astronomers investigated a mysterious Jupiter-size object called LSR J1835+3259, located about 18.5 light-years from Earth. The object is a few dozen times more massive than Jupiter, suggesting it is too heavy to be a planet but too light to be a star, the researchers said. They suggested that LSR J1835+3259 is a brown dwarf, a strange misfit object sometimes known as a failed star. As massive as brown dwarfs are compared to planets, they are too puny to force atoms to fuse together and release the nuclear energy that powers stars. In 2001, scientists unexpectedly discovered that brown dwarfs could generate radio waves. "That was very surprising," said Gregg Hallinan, an astronomer at the California Institute of Technology in Pasadena and lead author of the new study. "Typically, we see radio waves from really active stars, not objects with much cooler temperatures like brown dwarfs," he told Space.com. Auroras detected on the brown dwarf LSR J1835+3259 are much brighter than auroras on Earth, possibly 1 million times brighter than the best northern lights we can see, scientists say. In 2008, Hallinan and his colleagues found that LSR J1835+3259 emitted radio waves in pulses. "We knew that radio pulses from planets in our own solar system were caused by aurorae, so we thought maybe brown dwarfs had aurorae too," he said. Using the Karl G. Jansky Very Large Array in New Mexico to scan radio wavelengths of light, along with the Hale Telescope on Palomar Mountain in California and the W. M. Keck Observatory in Hawaii to scan visible wavelengths of light, the researchers detected the telltale signs of auroras on LSR J1835+3259. 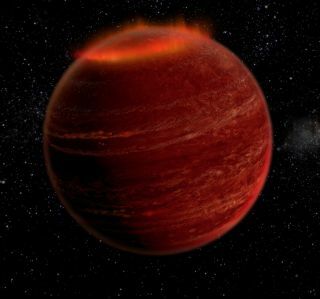 "If you were to somehow stand on the brown dwarf's surface and survive — the surface gravity is maybe 100 times more intense than Earth's, and the temperature is several hundred to several thousand degrees — you'd see a beautiful bright-red aurora," Hallinan said. "The colors of auroras depend on whatever the atmosphere they take place in is made of. In Earth's case, it's mostly green and blue and red because of oxygen and nitrogen. When it comes to Jupiter, Saturn and brown dwarfs — which have hydrogen-rich atmospheres — you'd see red, and there would be ultraviolet and infrared wavelengths as well." Until now, the brightest known auroras came from Jupiter, which has the most powerful magnetic field in the solar system. In comparison, these newfound auroras are more than 10,000 times — and maybe 100,000 times — brighter than Jupiter's, Hallinan said. This is because LSR J1835+3259 has a magnetic field perhaps 200 times stronger than Jupiter's, he said. One possibility is that LSR J1835+3259's auroras are driven by an Earth-size planet that generates strong currents in the brown dwarf's magnetosphere as it barrels through its magnetic field, Hallinan said. Auroras on Jupiter are driven, in part, by its moon Io plowing through Jupiter's magnetic field. Another possibility is that electrically charged particles might rain down on the brown dwarf from above to drive the auroras. It remains uncertain where such particles might come from — perhaps interstellar gas and dust, or matter venting from a nearby volcanic planet, or plasma originally spewed upward from the brown dwarf itself, Hallinan said. Hallinan and his colleagues have developed a new array of radio telescopes, the Owens Valley Long Wavelength Array in California, dedicated to detecting far-off auroras. "We've already confirmed aurorae for a few more objects," Hallinan said. "Maybe 10 percent or higher of brown dwarfs may exhibit aurorae." Moreover, Hallinan suggested that it may be possible to detect auroras from exoplanets circling other stars — specifically, gas giants larger than Jupiter with powerful magnetic fields. "Extrasolar aurorae could help us measure how strong the magnetic fields of extrasolar planets are," Hallinan said. The scientists detail their findings in the July 30 issue of the journal Nature.